The most common error that is produced for auto reconciliation in QuickBooks Online is an 'Invalid Item Ref' error. 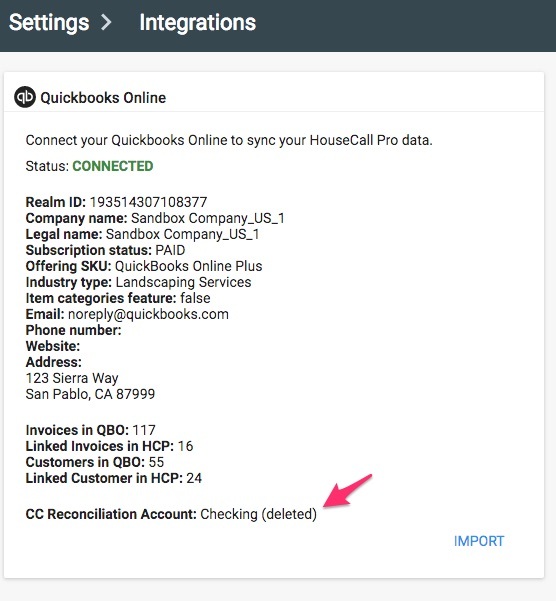 The most common cause of this error is an account in QuickBooks Online being deleted, and that account is one HCP was configured to use to auto reconcile your credit card payments. The most frequently deleted account in QuickBooks Online is the checking account. Please first check your QuickBooks Online configuration under Settings, the configured checking account is listed there, and if deleted it will note that. In QuickBooks Online, click 'Make Active' next to the deleted account in the chart of accounts. Open the blue chat bubble to work with a support representative, provide the name of the new checking account in QuickBooks Online. This account should be where you want the credit card payments to reconcile to.